I've been using my GPS a lot lately. It's a simple Garmin e-Trex model (about $100), with a minimum of bells and whistles. I can enter map coordinates and find my way to a pre designated site, and, more importantly, if I mark the car in the parking lot, I can navigate my way back. My GPS tells me my altitude at any given time and the distance I have yet to go to a particular point. I can't order a pizza or use it to calculate my taxes, but I'm OK with that. I got some paper money from who knows where Friday and left a sack of split shot fishing weights. We had post holed our way about a half-mile through 5 or 6 inches of snow from a gravel road to the Map Guy Cache. It had been a couple of years since we'd been out to this remote outcrop, but the cache was still in great shape. Map Guy and I planted the cache in March 2003 inside a Bulletin newspaper box. Apparently, my cartographically gifted sidekick felt some responsibility for the hidden trove, so he replaced the open-ended box with a can after that first messy winter. 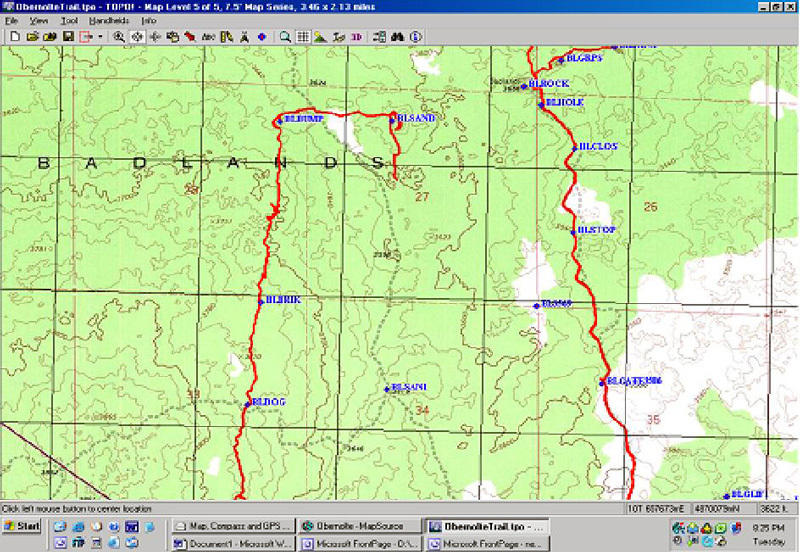 Shown above is a screen print of Garmin's MapSource computer program. These maps are the only maps that can be uploaded to the Garmin GPS models. The map scale (detail) is "comparable" to the USGS standard for 1:100,000 map scale. The ten western states are contained on one CD. Note that the program is set to the highest scale (detail). 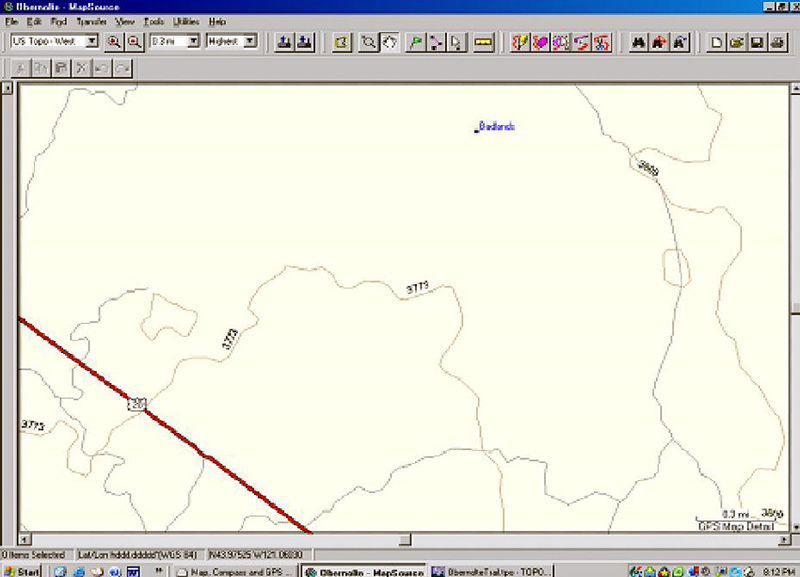 Shown above is a screen print from the $99.00 Maptech Terrain Navigator computer program for the State of Oregon. This program offers exact copies of the base maps of the United States made by the USGS. These maps are 1:24,000 map scale (detail). (Eight CDs are needed to contain just the detail of the 1,900 Quad topo maps for the state of Oregon only!) We suggest you purchase the $99.00 Map Tech Terrain Navigator program (shown here) or the $99.00 National Geographic TOPO program for your State and a simple $99.00 Garmin eTrex H and a $25.00 cable, or a $175.00 Garmin Venture HC, if you need a USB cable connection for your computer. The Venture HC has a base road map of the entire United States, however you need to spend another $99.00 for the Garmin Map Source program which offers up-loadable maps to your GPS two inch screen at less than 1:100,000 detail. Don't forget the declination adjustable base plate $30.00 Suunto M3 compass and the skills to use these together!